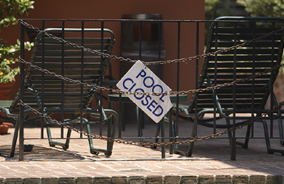 “Pool Closed Until Further Notice.” That’s what the sign said. Our three children, my wife and I, all huddled around the sign with wide mouths, our towels hanging in one hand and a beach bag full of goggles and water missiles and squirt guns in the other. We had checked in at the hotel just ten minutes earlier, strolling by the indoor pool window and smiling as another family laughed and splashed together. But now it was vacant. Pool closed? What the hell happened in just ten minutes? Okay, my kids were present, so it was more the sanitized “What the heck happened?”, but it’s the thought that counts. Dark storm, rain on me. It had been a rough week already–the story for most of us anymore, isn’t it? Which is why my family likes to get away, even if only to the next town for a one-nighter. It doesn’t cost much, it feels like a vacation, and it’s just fun to stay at a hotel, go out to eat, stay up late in bed watching movies together, and…swim at the pool. Being duped numerous times by the impressive Internet marketing efforts of the hotel industry and their embellished website photos displaying beautiful pool rooms, hot tubs, fresh towels, the Allsmiles Family, and all the fun you’re gonna have, etc., I had called ahead this time to confirm that one, they had a pool; two, the pool was bigger than a bathtub; and three, the pool was open. The main event for this mini-adventure was to swim in the pool. We would even skip the restaurant and force down cheap pimento-loaf sandwiches in the hotel room if it bought an extra hour in the pool. Pool. Closed. The sign was mocking us now. God, c’mon…really? One little blessing. Just one little joy. That’s all I had asked. The kids need this. Sarah needs this. And I need this. With sad faces and heavy hearts, Sarah and the kids walked back to the elevator. I exhaled my frustration and walked toward the front desk. “So what’s the deal with the pool?” I faked a smile. “Our maintenance guy has another emergency and can’t get here,” said the manager, avoiding eye contact. “We’re trying to get someone out here, but the pool will probably be closed for at least twenty-four hours,” he said, still bouncing his eyes between the computer screen and a stack of paper. The guy was obviously withholding something, and we didn’t have twenty-four hours. “I called this morning and you guys said the pool was open. That’s the whole reason we chose this hotel.” Blood was rushing to my ears. Son of a gun. One of those kids just yarked in the pool. Our pool. Thanks, other family, for ruining my family’s weekend. Thanks, other family, for infecting our chlorinated blue lagoon with (WARNING: excessive adjective alert) yellow, mucousy, acidic, orange-chunk-ridden soup upchucked from the gut of your sick child. Thanks. Why does this always happen to us? Why does this always happen to me? Hi, I’m Clark W. Griswold. I’m a target for all things crap. Ever feel that way? With barely any flip left in my flop, I trudged back to the room to share the news. On our previous attempt for a getaway, I opted for a cheaper hotel to save money. That bought us a dirty room and an outdoor three-man pool nestled between two parking spaces (remember the impressive website photos?). Nice going, Dad. This time I spent the cash for the nicer place, and I still couldn’t win. I stood outside the door and listened. I could hear bathing suits being shed and repacked, suitcases zipping, and television channels flipping. Beyond that, no conversations. The words usually seem to pass unimpeded through their little heads, but I know someday they’ll be standing outside of this hotel room with the same bad news, or their family vacation will be cut short when the car breaks down on the interstate, or any number of incidents I like to call Griswold Moments. Someday, I thought–hoped, rather–the words will prevail over the harsh truth of disappointments in their own lives. I said a little prayer. I forgave that other family for ruining my weekend. Actually, I forgave myself for denying them a Griswold Moment–we’re all entitled. And I told myself Brock, it starts with you–make the best of it. I opened the door. All four of them were seated on the double beds, watching television, waiting for me, and to my surprise still wearing bathing suits. “Sorry guys. Pool’s closed. And it ain’t gonna be opening,” I said in my native Midwestern twang. “Daddy, we can still swim in the hot tub!” said our 11 year-old daughter, always looking for the positive. “We can ask the manager!” she said, reaching for the phone. For the next thirty minutes, we soaked in 100 degree bubbling water on the hotel’s back patio, with a mountain view and a brisk air temperature of 42 degrees. We floated, we fired water missiles, we shot each other with squirt guns. We made the best of it. 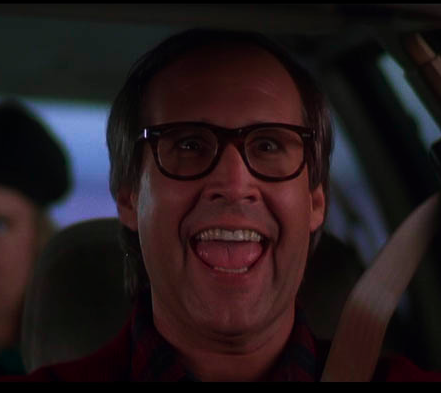 Do you have any Griswold Moments that you’d like to share? Leave a comment. I’d love to hear about it. And the house is quiet & dark, no doubt dreams of XBox 360 have replaced sugar plums…then arose such clatter…I laughed out loud. “Target for all things crap” No flip left in my flop. I lost it! Way loudly. And the dog barked even. I too am in the top 10% of the lower third of the class – I’m at a steady D average. Awesome post. Awesome lesson. hang in there,pool is closed, ice skating center is open, find a way to go.you will be fine!Happy Sunday!Happy Holidays!Welcome to Jingle Poetry…Award/Treats 4 Poetic Friends of Jingle, Happy Sunday! I loved that piece! I’m sure there are several but the only Griswold story which currently comes to mind is that piece of sh*t MOTEL we stayed in traveling through Tennessee one very late night and couldn’t find another hotel with a vacancy so we took this one…booger ridden walls, leaky ceiling, something brown smeared near toilet paper roller in bathroom and dirty carpet. We slept in our clothes; um, we laid on top of the the nasty bedspread for several hours wearing our clothes. Finally at 5:00 a.m. I suggested we just get up and leave and just get back on the road. So gross! Kathleen, thank you for visiting.David, thanks. No doubt we all get many bad situations to test our attitude. I think this one bumped my grade from an F to a D-. :)Ann, believe me, I was shocked. My kids ripped me for booking the previous cheaper hotel. I thought for sure I was in for it when the pool closed at the nicer hotel.Melissa, thank you very much for sharing. But about passing with flying colors, see my comment above to David. For every test we’ve passed, there are ten others we’ve failed. Sometimes we just have to keep going around that mountain like you mentioned! 😉 Thanks also for joining the Lifesummit follower list! I so loved reading your post, and I felt every bit of your pain. But I smiled the whole way through because your story is so much “our story.” Yes, I smile now. But I didn’t in the moment–in all those times of frustration and disappointment– and neither did my husband. I wonder, had we reacted as well as you did, maybe we wouldn’t have had to go ’round the mountain so many times. Gratitude in the midst of trial is a real challenge. Your family seems to have passed with flying colors! Thank you for sharing, and bringing a smile this night. May blessing abound at your house! I want your kids to hang out with mine for about a week–maybe their great attitude would have rubbed off! Mine (and I) might have been pouting for a while.But cable television would have eased the pain. That’s a treat for them, since we only have the bare minimum local channels at home. No flip left in your flop? That’s a great line. Nice story about leading the crew. Makin the best of a bad situation? Nancy, okay, Colorado isn’t THAT bad. 🙂 ha ha…and I love that prayer scene with the grandma. Thank you, too, for visiting Lifesummit! Wait…I thought living in Golden, Colorado WAS a vacation! Always good to see good old Clark Griswold. Thought of him today–my son played piano at a Christmas luncheon for local seniors and we stood to say the Pledge of Allegiance just before eating. I immediately thought of the grandmother’s prayer just before the Griswold Christmas dinner. Anyway…I enjoyed your piece and yes, darn it, all those life lessons do begin with us, don’t they? Thanks for stopping by my place today. Nice to meet you. This story brought tears to my eyes–it was so sweet and so very true how life happens sometimes. You all made the best of it and that’s all we can do with the disappointments we get in life somedays but that’s when we really shine for who we are. Your kids will remember a father who made the best of it and when they run up against a wall, this memory will have them climbing over it. Next Next post: Coincidence or Divine Conspiracy?